BANNER BANNER EMPLOYMENT BANNER BANNER Your Health Q & A with Troy Leggett I have been told that by choosing appropriate foods between the ages of 50 and 70 may help defy aging. What do you suggest? It is recommended that we follow a diet high in antioxidants so we can live a healthier life for longer. Chemicals that damage our cells and promote aging and disease can be neutralised by foods rich in these antioxidants. This can be achieved by including foods rich in vitamin A, vitamin C, vitamin E, selenium and some phytochemicals. Foods that can be converted to vitamin A are from yellow, orange and dark green fruit and vegetables, e.g. sweet potato, carrot, pumpkin, cabbage, spinach, capsicum, apricot, mango and rockmelon. Liver and eggs also are a good source of vitamin A. Vitamin E is one of the most effective antioxidants which also can protect vitamin A from being chemically changed. Good sources of vitamin E include wheat germ, almonds, hazelnuts, peanuts, pistachio nuts, soya beans, safflower oil, sunflower seeds and olive oil. In addition to being an antioxidant, vitamin C which is known as ascorbic acid is necessary for iron absorption, body growth, tissue repair, wound healing and protection against infection. Good sources of vitamin C include asparagus, broccoli, brussel sprouts, cabbage, capsicum, parsley, tomatoes, blackberries, grapefruit, guava, kiwi fruit, mango, melon, oranges, pineapples and strawberries. It is important to note that regular drinking and smoking may decrease the absorption and the levels of vitamin C. Selenium is thought to have anti-cancer properties and is high in foods such as brown rice, wheat germ, wholemeal bread, poultry, fish, shellfish and brazil nuts. 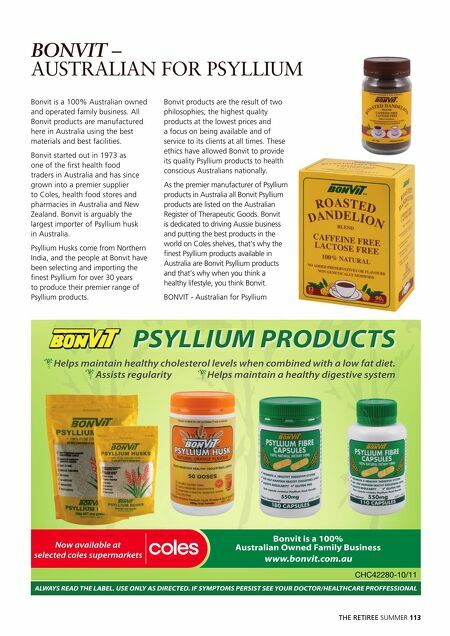 Phytochemicals are naturally occurring protective chemical found in foods of plant origin that can have an antioxidant effect to protect cells from diseases such 112 THE RETIREE SUMMER as cancer, cardiovascular disease, urinary tract infection, rheumatoid arthritis and poor immunity. Foods that are high in phytochemicals include whole grains, broccoli, brussel sprouts, cauliflower, citrus fruits, dark green leafy vegetables, garlic, tea, herbs, spices, onions, tomatoes and soya beans. By following the current recommendations of five serves of vegetable and two serves of fruit every day we should be able to achieve an appropriate intake of the foods listed above. I have read that some medications may block the absorption of important nutrients to my body. If I am on medication how can I address this? If you take medications you should speak with your GP or chemist to find out which nutrients you may be missing out on and also which foods may actually improve or in some cases block the effects of your medication. It may be as simple as taking medication with foods or on an empty stomach or avoiding alcohol and foods high in sugar and sodium. It is essential you seek appropriate medical advice before changing methods of medication. I seem to be experiencing constipation more often recently. What advice do you have? As people age food tends to move slower through the small intestine due to the muscles contracting at a slower rate which may lead to constipation or difficulty with bowel movements. The best method to decrease constipation is to include high fibre foods such as whole grains, legumes, nuts, fruit and vegetables. In addition, physical activity and drinking plenty of water combined with enough dietary fibre will assist in avoiding constipation. How do I achieve the appropriate intake of water and fibre? To achieve the appropriate fibre intake aim to include a bowl of porridge or wholegrain cereal each morning, two pieces fruit per day, and vegetables or salads in your lunches and evening meals. Additionally, it is recommended you drink six to eight glasses of water each day. It is important to note that as we have no way of storing water in our body and need to continually replenish our body with water. I have been told to keep active even after I have retired. What benefits will I see and what are some examples of physical activity? As you age there is a reduction in muscle and increase in body fat. It is therefore essential you do moderate exercise to preserve muscle mass. Examples of activities include golf, walking, yoga, tai chi, swimming, aqua aerobics, tennis, and bodyweight exercises. In addition, regular exercise will keep your bones strong, enhance your mobility and flexibility and increase your sense of well being. You are likely to meet more people, relax, build self esteem and most importantly, reduce the risk of age-related diseases including diabetes, cardiovascular disease and osteoporosis. 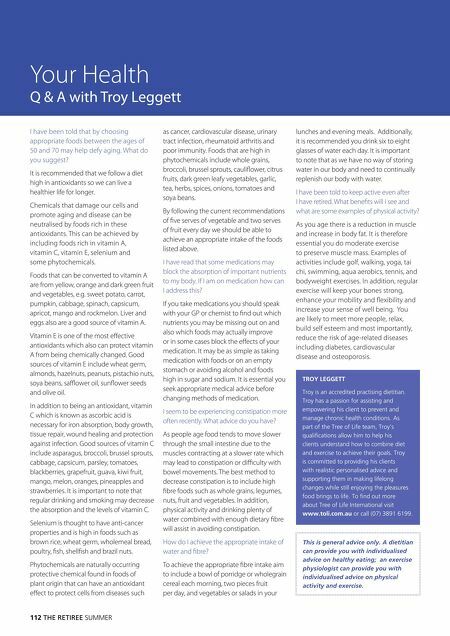 TROY LEGGETT Troy is an accredited practising dietitian. Troy has a passion for assisting and empowering his client to prevent and manage chronic health conditions. As part of the Tree of Life team, Troy's qualifications allow him to help his clients understand how to combine diet and exercise to achieve their goals. Troy is committed to providing his clients with realistic personalised advice and supporting them in making lifelong changes while still enjoying the pleasures food brings to life. To find out more about Tree of Life International visit www.toli.com.au or call (07) 3891 6199. This is general advice only. A dietitian can provide you with individualised advice on healthy eating; an exercise physiologist can provide you with individualised advice on physical activity and exercise.